Catherine Arndt, a rising senior at Baylor University, explains the project she did in Prof. Jaime Cardenas’ lab as part of the “Nano-, Bio-, and Quantum Photonics” research experience for undergraduates (REU) program offered through the Institute of Optics this summer. The program engages participating students in the frontiers of photonics research in nanoscience, bioscience and quantum science while at the same time providing them with experiences to recognize the excellent career opportunities, both academic and industry based, available in photonics. 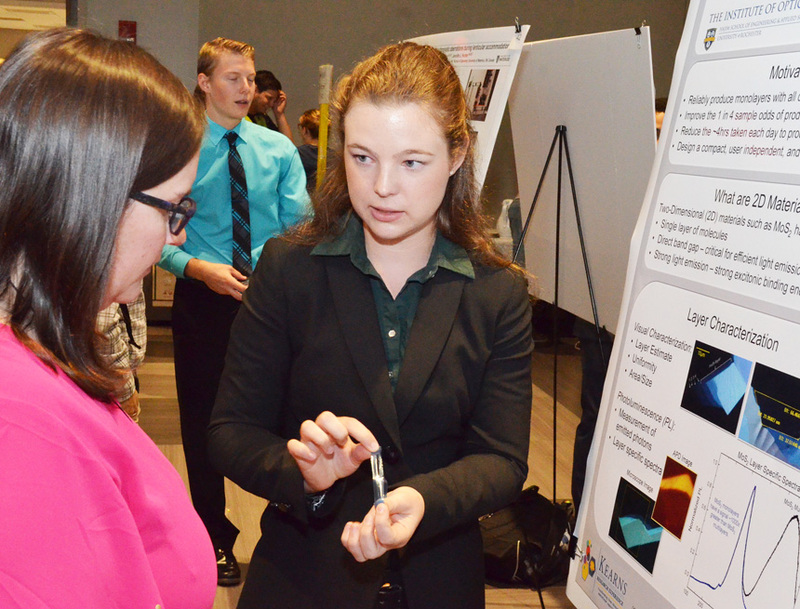 Catherine Arndt, who was introduced to ultra-thin nanoscale optical films at Baylor University, contributed to the study of similar materials at the University of Rochester’s Institute of Optics this summer. Similarly, Zachary Manning, a physics student from Lawrence University in Appleton, WI, helped refine a new imaging technique for detecting dry eye, a disorder that is increasing in prevalence and can lead to cornea damage and reduced vision. Both were among 12 students from other universities participating in a new research experience for undergraduates (REU) program offered this summer by the Institute and the David T. Kearns Center for Leadership and Diversity. Funded with a grant from the National Science Foundation, the “Nano-, Bio-, and Quantum Photonics” REU matched the visiting students on projects with an interdisciplinary team of faculty members, scientists and graduate students from not only the Institute, but the departments of chemistry, dermatology, electrical and computer engineering, and ophthalmology, and the Laboratory for Laser Energetics. “This program was amazing,” says Arndt, a physics major and rising senior who started “looking into optics” as a result of working in the lab of Assistant Professor Howard Lee at Baylor University. His lab develops ultra-thin, nanoscale optical films with electrically tunable properties. This summer, she worked with Jaime Cardenas, assistant professor of optics, on “High Yield Automatic Mechanical Exfoliation of Two Dimensional Materials.” She built a device to automate the separation of films used by the Cardenas lab to study how layers of nanoscale films only a single molecule thick can be applied to optics on a chip. As a result, she explained at a Kearns Center research symposium, a process that used to take an entire day when done manually, can now be completed, at a higher success rate, in two minutes. “Prof. Cardenas gave me a project that really worked with my interests, and really fostered my interest in optics,” Arndt said. The Institute of Optics and Department of Physics at Rochester will be on her list of places to apply for graduate school, she added. The Nano-, Bio- and Quantum Mechanics REU program concludes with students presenting their research at a day-long symposium sponsored by the David T. Kearns Center, alongside students from three other REU programs, plus other summer programs involving undergraduates in mentored research. 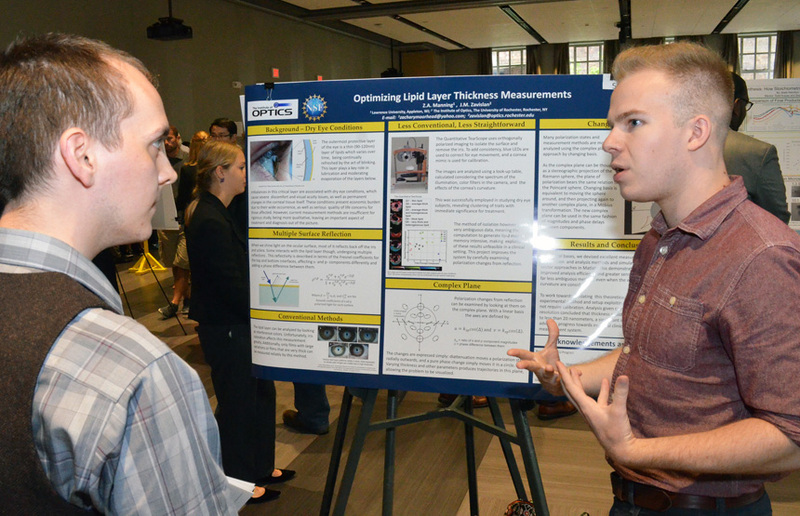 Zachary Manning, whose poster is shown here, did his project in the lab of James Zavislan, associate professor of optics. Manning, who is interested in pursuing planetary physics, said he appreciated the opportunity to work with James Zavislan, associate professor of optics, on “Optimizing Lipid Layer Thickness Measures.” Zavislan’s lab uses polarization sensitive imaging to scan the outermost, lipid layer of the cornea to detect dry eye. Manning explored ways to optimize the process for potential clinical applications. Applications for next summer’s session will be accepted starting this fall. Click here to learn more about the “Nano-, Bio-, and Quantum Photonics REU program. “A New Wavefront Sensor to Measure Monochromatic Aberrations during Lenticular Accommodation,” by Joseph Caron, Michigan Technological University, mentored by Jennifer Hunter, associate professor of ophthalmology. “Noninvasive Optical Measurement of Bone Strength: Introducing a Spectroscopic Interpretation,” by Anna Emenheiser, Kalamazoo College, mentored by Andrew Berger, associate professor of optics. “Finite-Element Modeling of Waveguide Structures Using COMSOL,” by Nolan Coble, the College at Brockport, mentored by Benjamin Miller, professor of dermatology. “Demonstrating Nonlocal Spatial Dispersion Cancellation for Transversely Entangled Photons,” by Nicholas Zollo, University of Central Florida, mentored by graduate student Nick Black in the lab of Robert Boyd, professor of optics. “Developing Fiber Amplifier Models from Measured Experimental Parameters using RP Fiber Power Software,” by Joseph Peltroche, Queens College, mentored by Jake Bromage, senior scientists at the Laboratory for Laser Energetics. “Designing a High-Speed Funds Camera for Retinal Imaging of the Living Eye,” by Nicholas Sorabella, Stonehill College, mentored by Jesse Schallek, assistant professor of ophthalmology. “SnTe Nanocrsytals Synthesis: How Stoichiometric Ratios Affect Size and Absorption,” by Malik Hamilton, Knox College, mentored by Todd Krauss, professor of chemistry. “High-Order Symmetry Breaking in Photon Pair Correlations from an Optical Microresonator,” by Dana Griffith, Wellesley College, mentored by Qiang Lin, associate professor of electrical and computer engineering. “Characterizing Thermal Drift Factors for the UltraSurf Metrology Instrument,” by Alyson Fritzmann, Lawrence University, mentored by Jannick Rolland, professor of optics. “Single Photon Interferometry: Measurements of Photon Properties,” by David Spiecker, Rochester Institute of Technology, mentored by Nick Vamivakas, associate professor of quantum optics and quantum physics.